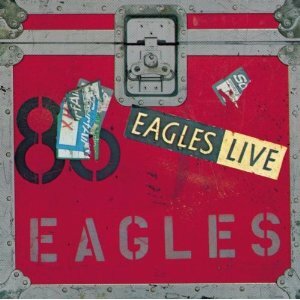 Eagles Live is the first live album by country rock group The Eagles and was mainly recorded in late July 1980 at Santa Monica Civic Auditorium in Santa Monica, California. Five extra songs were recorded in October 1976 at The Forum in Inglewood, California. Wikipedia reports that Glenn Frey and Don Henley mixed the album on opposite coasts and it’s said to be heavily doctored. I wonder how many fans of The Eagles are satisfied with the set list? I think most would insist on Hotel California, Desperado, Take It To The Limit and Take It Easy but I’m not sure about the rest. It seems to me that this was a big opportunity missed to put together a comprehensive overview of the band performing live in concert. At just 77 minutes, it’s far too short for a double CD and more songs could have been added when it was re-released. There are so many classic Eagles songs missing from the album. It’s The Eagles. Allegedly it is heavily doctored. The result is that there’s a close match to the studio songs. While in some ways I can admire a group who have the ability to exactly reproduce their studio sound live, it’s not a formula for making great live albums. What’s the point of playing the studio versions very loud? I want improvisations, medleys, banter, a sign of the personality of the band. Mmm not sure we should go there. It’s said that they cheated by fixing the sound in the studio. It’s a live compilation rather than a representation of one night or even a tour. Often this means that the album gains in set list and performances categories but loses in this section but we have the worst of both here. There’s not much live atmosphere or feel to it. The crowd sound very muted and there’s not much talking from the stage. The group changed between 1976 and 1980 with Randy Meisner replaced by Timothy B. Schmit on bass guitar and vocals. This is a live album where the overall performance is somehow more than the sum of the parts. It is disappointing but it’s not horrible. I have a soft spot for The Eagles because their music brings back a lot of happy memories. The album hasn’t created much of an impression on me. I tend to listen to the studio albums and a compilation in preference to this live album. I haven’t seen this featured on the best albums lists. Reviewers at Amazon are kinder than I would have expected. What Do You Think About The Eagles Live? Should a group seek to create the studio sound live? And if so, do you think The Eagles succeeded? This entry was posted in 1980s Live Albums, Classic Rock Live Albums, Country Rock Live Albums and tagged 1980 live albums, 1980s classic rock, 1980s Country Rock, classic rock 1980, The Eagles Live Albums by Paul Simister. Bookmark the permalink.